This is a temporary website . Our new hosting platform doesn’t support our old website. A new site will be uploaded soon. The Market Inn is just a short walk from both the town centre and the brewery. Somewhat confusingly to visitors to Faversham is that the pub is not in the market place in the town centre but about three minute walk away. The pub was in fact named after the Victorian cattle market which used to be held nearby. The Market Inn is now the only survivor north of the railway line of a number of Victorian pubs built to cater for the increasing population when the town expanded in the 1860s following the arrival of the railway. Although over the years the pub has been altered it still retains separate Saloon and Public Bars. A recent extension provides a spacious area in which we stage regular live music, it also has two Pool tables, Darts boards and additional seating away from the main bar areas. Our beer garden is probably the largest in Faversham. Here you will find comfortable seating in our covered outside area or traditional benches on our paved terrace. During the summer months you may well see the Kentish game of Bat and Trap played on one of our two pitches. 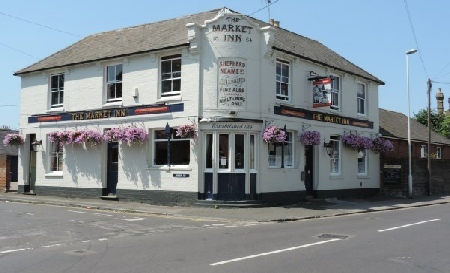 The Market Inn remains very much a traditional community pub and is often the pub of choice for large gatherings in Faversham for old and young alike.